CW Industries Fully Enclosed Micro Miniature Slide Switches Ideal for Hostile Environments » HHP Associates, Inc.
CW Industries fully enclosed “G” series micro miniature slide switches are capable of switching up to .05 amps @ 125VAC with electrical contacts that are completely enclosed for protection from hostile environments. Theses switches are micro miniature in size and available in SPST and SPDT positions. Two mounting options are available with no mounting hardware required. Snap in for panel mount applications or plug in for mounting directly onto a printed circuit board. 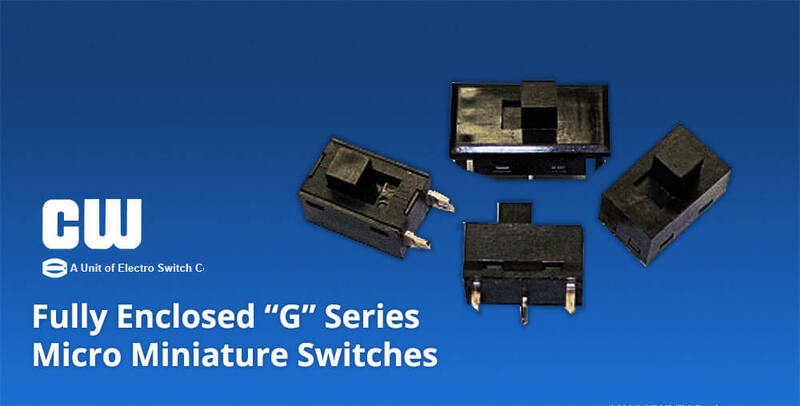 The G105 and G107 Series switches are ideally used on PCB’s where space is critical or in applications where high reliability low voltage and low current switching is required. The extended linear motion of the moving contact over the stationary contacts causes a full wiping motion at each switch actuation resulting in reliability and long term performance. The switches are UL/CSA listed and have an operating temperature range of -20o C to +105oC. Lead free and RoHS compliant, typical applications include electric shavers, dog grooming equipment, instrumentation and measurement devices, motor driven appliances, model cars, hand held devices, computers, telecom equipment, thermostats and medical devices. A wide range of options are available including terminal type and size, materials, switch color and topper designs. Serving customers since 1904, CW Industries is a vertically integrated design and manufacturing company serving many of the leading industrial, consumer and defense electronics manufacturers with complex electromechanical slide, rocker and pushbutton switches; insulation displacement and MIL SPEC connectors; and a variety of custom switches, custom connectors and assemblies that require a high level of precision, performance and reliability. Their in-house capabilities include molding, plating, stamping, tooling, CNC machining, welding and assembly. CW’s build to print work cells and contract manufacturing business unit support a wide range of applications in the aerospace, defense and medical industries. CW is ITAR registered, IS0 9001 certified and their in house environmental and chamber test facility is qualified to UL, CSA and DOD standards. We are honored to serve as a manufacturer’s rep for CW Industries, which supplies leading industrial, consumer and defense electronics manufacturers with complex electromechanical slide, rocker and pushbutton switches; insulation displacement and MIL SPEC connectors; and a variety of custom switches, custom connectors and assemblies that require a high level of precision, performance and reliability.